In November 2007 the Massey Lectures titled “The City of Words” was broadcast as part of the CBC Radio’s Ideas series. I heard it the same year through the ABC Radio during a few Sunday afternoons. It was usually around the time when i as preparing dinner and i was in the kitchen, amazed and delighted. 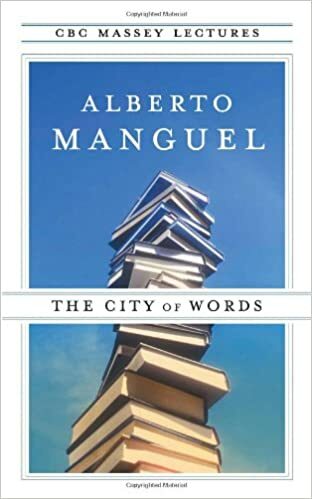 Alberto Manguel is the author of this particular lecture and I subsequently bought the book and devoured any other writing of his i could find. This is an extract from one of the chapters and i am posting it in here to indicate where I am going with the next body of work, post PhD…. When all is said and done, at the end of the day……numerous platitudes come to mind. Meanwhile I am left with a mixture of feelings……which brings with it a tentative start to the new year. Completion number 1. 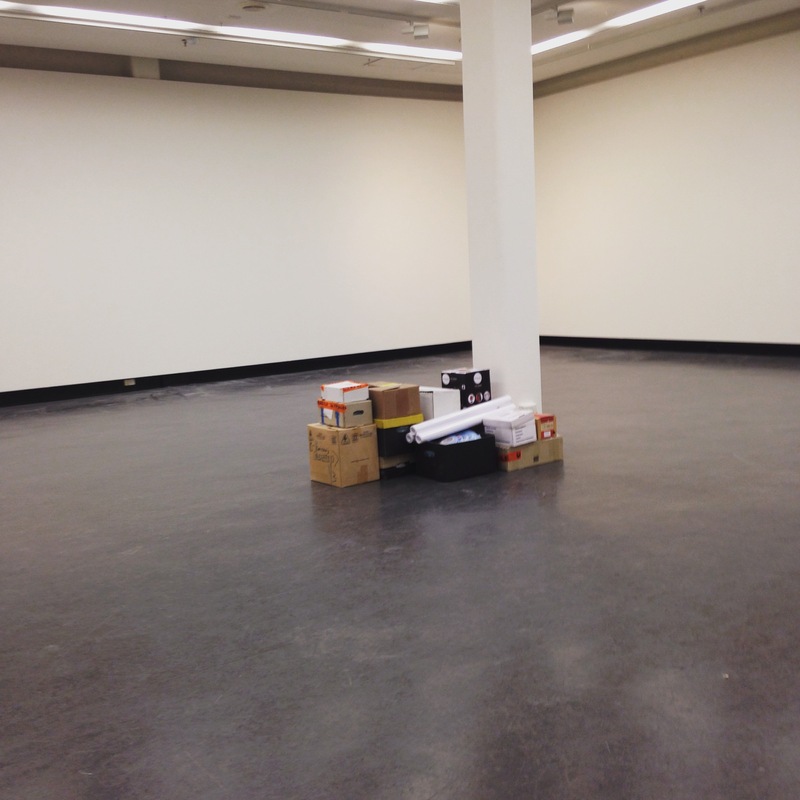 – To begin with, experiencing the set-up of my work at RMIT School of Art gallery was a challenge. One in which I could not have conquered without my partner Andreas Amentas. Planning, shifting, manoeuvring tabletops and legs, plates and bowls, boxes and bubble wrap and then, moods and fears, food and wine…..would all have been impossible without Andreas beside me. Thank you Andreas. The work was only in the Gallery for a week and on the Wednesday my examiners came through and marked, wrote and commented on both the Dissertation and the manifestation of that – the three dimensional work. I was uneasy, secretly annoyed that it was not possible to discuss or communicate with the examiners, but also, quite relieved that I had nothing to do…. Then the opening night with friends and the following day, the pack up…. Completion number 2. – In between the PhD Completion at RMIT Melbourne and the Narek solo show on the New South Wales coast, I continued to make in the studio…….I had a feeling that some added work was needed just to complete a few of the series. I also considered the galleries clients and how in any show, a price range, from low to high, would be appreciated. 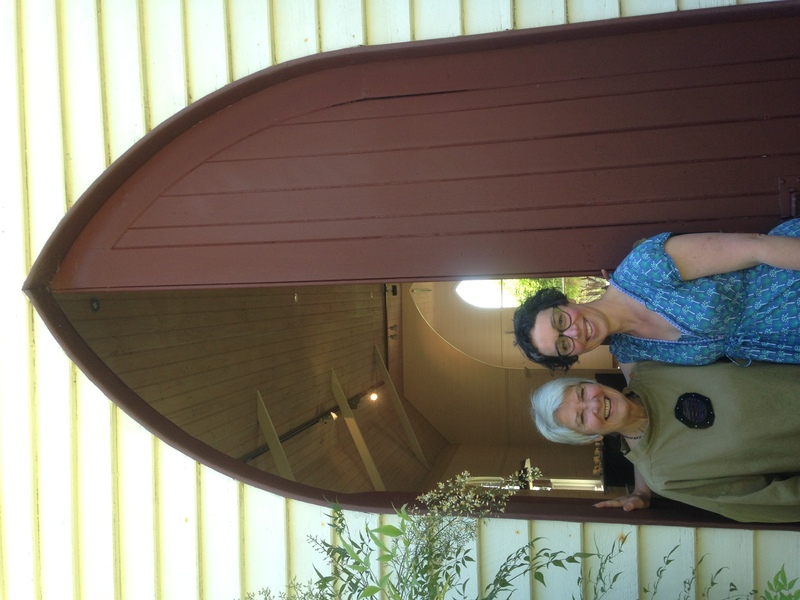 So, after a few pyjama days, a few more months in the studio and a lot of firings, I boxed everything off and headed to Tathra. Narek Galleries is run by Karen O’Clery. 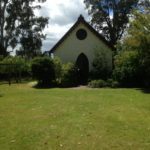 It is the old Tanja church, a small timber building, converted to a beautiful gallery space. 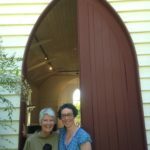 My solo show was the last to be held in the space, as Karen had sold the space (just that month) and is now moving her business and further gallery opportunities to Bermagui. 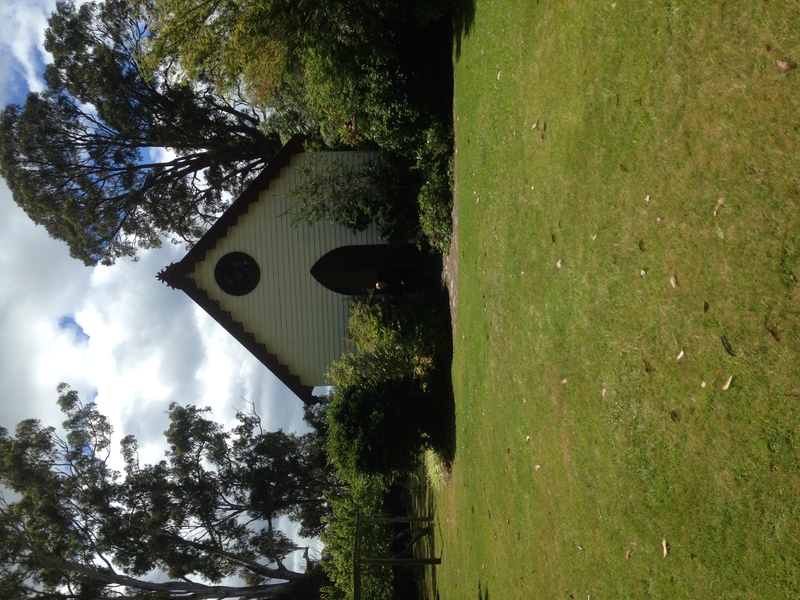 I do love holidays, I really like travelling and I also love the wide open spaces of the coast line, so I had a great week in Tathra, with my family too. The exhibition was a success, financially as well as …emotionally? I’m not sure how to describe it but it was …satisfying, that’s a good word for it. I got to share the work in a space that played with light and therefore was able to reflect a mood or an ambience that wasn’t present in the RMIT gallery. The clients that Karen invited to the opening night were also interesting and what I gleaned from their experience of the show was invaluable. I think having the opportunity to exhibit and mingle and talk and discuss your work and ideas is something only now, as a more experienced maker, I appreciate. 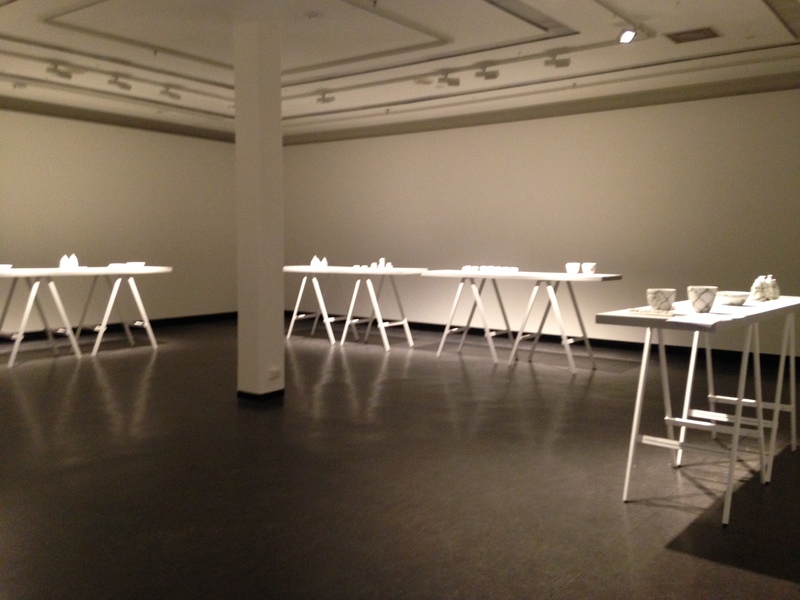 The people at the opening asked me questions such as; how on earth are politics and porcelain linked? Why is there so much pain on the images of the work? Tell me about why there is….the image of a ribbon..for example and interestingly…I don’t need to understand the narrative, I like to feel the work with my hands…….input and questions which delighted and surprised me. One month later, after a few weeks, I received the few left over/unsold work from the exhibition and proceeded to sleep like never before!! Today, as I write this, it is the first day of February, 2017. After completing the PhD and the Dissertation, the solo show and subsequently the year, I am faced with the inevitable question…what are you going to do next? As politicians say whilst collecting their thoughts during an interview………………………………that’s an interesting question……………………………! 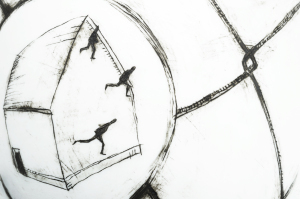 Form and Surface Narrative -my PhD Intro…. The creation and legitimisation of a culture and its political position is not immediately associated with decorative functional ceramics. It may seem fanciful to use three-dimensional forms to directly manipulate people’s views and promote a leader or redefine a nation. However, throughout history, the surfaces of a variety of decorative objects have carried visual narratives to promote power and political positions. Understanding how this has been achieved frames this dissertation. How can an investigation of selected historical narrative ceramics inform the development of a new body of ceramics that reflect aspects of twenty-first century Australian politics? In what way can drawn images on the surface of three-dimensional ceramic forms convey political ideas? In what way can form and surface imagery be combined in the construction of a political narrative? 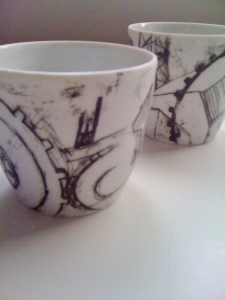 Functional narrative ceramics, a genus of craft, formed the basis and starting point for my artwork and research. Bowls, cups, jugs, teapots, and plates are forms with an intended domestic use. Narrative is defined by The Concise Oxford Dictionary as ‘a tale or story’ (Sykes 1985, 673). An account of events or experiences, whether true or fictitious can therefore be represented through both language and images. For the purposes of this research I confined my discussion to the role visual, pictorial narratives might play on the surfaces of objects. As author James Fentress notes, a story can be ‘a natural container for memory…a way of sequencing a set of images…a way of ordering our knowledge’ (Fentress and Whickham, 1992, p. 50). On the other hand, a narrative can bring together disparate elements and be open to interpretation. Ceramic forms that use visual narratives extend their functional role as vessels and tell us about the world we live in. Political conditions can determine the role that ceramics play within society. For instance, when the exercise of control over a nation or society is paramount (such as autocratic rule), the surface decoration on ceramics is utilised by rulers and dictators for propaganda purposes or aimed at promoting supremacy (Wardropper et al., 1992, p. 14). Surface narratives can also carry a royal family or government’s status or seal, confirming authority and political position. For example, the Commemorative ware of the British Royal families have existed since the reign of Queen Elizabeth I (1558–1603), memorialising births, weddings, anniversaries, coronations, jubilees, deaths, and visits. These ceramic forms skilfully utilised the functional requirements of consumption, while promoting and highlighting the reign and supremacy of royalty through the decorations on the surfaces. These types of forms continue to be marketed as diplomatic currency and as demonstrations of wealth and achievements both to the populace and abroad. The surfaces of these forms ‘are intended to reflect a sense of dignity and reverence’ (Clark, 1990, p. 66), parading portraits and silhouettes, busts of the king or queen, royal coats of arms, dragons, national flowers, armour, and decorative initials. As an example, objects also served a purpose for Napoleon Bonaparte (1769–1821) following the French Revolution (1789–1799) when France shifted from feudal reign to civil rights. When Bonaparte came to power in 1799 he ‘fostered relationships with leading intellectuals and artists in order to promote his reputation and popularize his image’ (Hanley, 2005), and used the deployment of the smallest coins to grand ceramic sets to promote his representation of history. By manipulating the surface decoration of familiar forms, such as coinage and ceramics within French society, Napoleon formulated his story of victory and triumph. Presentation vases (designed to be overwhelming and impressive by their size) narrated stories commemorating military victories. Cameo portraits of Napoleon and his marshals adorned tableware that was produced for the palaces and homes of French aristocrats (Coutts, 2001). However, in a democratic environment, personal expression and engagement with authority has greater freedom. Individual artists are able to communicate private concerns without fear of retribution. Ceramic forms and their surface narratives are less controlled by governments, mirroring the society and its regard for choice and freedom of expression. Thus, contemporary ceramic artists are able to discuss and comment on political situations of the twenty-first century through their artworks, without fear of government interference. My relationship with political porcelain objects was formed as an undergraduate art student in the 1980s. I was curious how Russian revolutionary pots made during the early twentieth century incorporated modern designs and political energy with traditional decorations on their surfaces. As such, I became interested in the contrast between what past cultures had integrated onto ceramic forms and the surface narratives of functional ceramics in the twenty-first century. This dissertation is divided into three chapters and explores how selected ceramics, through their durableness of form and surface imagery, record and comment on political histories. The first chapter of the dissertation examines the surface decorations of porcelain produced at the State Porcelain Factory in St Petersburg as Russia changed from feudal reign to communism. Following the Russian revolution of 1917, the Bolshevik Party utilised ceramics as part of their propaganda campaign. Surface narratives on traditional porcelain forms became promotional tools in the dissemination of communist ideals to the Russian nation and the world. Surface imagery was appropriated from a familiar language of folk and religious images and decorations in the construction of a political narrative. The work of three artists are discussed within this context. Alexandra Shchekotikhina-Pototskaya, Sergei Chekhonin, and Mikhail Adamovich cleverly combined traditional graphic symbols and styles that were familiar to the Russian community with controlled images and dictatorial political messages. 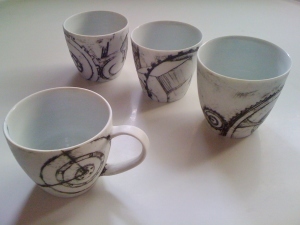 The State Porcelain Factory included artists who worked with the modern art movements of the time, such as the geometric abstraction of Suprematism and Constructivism. However, my dissertation will be confined to the artists which adopted traditional Russian motifs and styles to create propaganda. 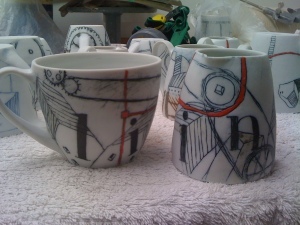 The second chapter of the dissertation explores how two contemporary Australian ceramic artists, Gerry Wedd and Stephen Bowers, respond and borrow familiar decorative patterns and motifs, and how British artist Stephen Dixon, comments on the political and cultural concerns of the twenty-first century. 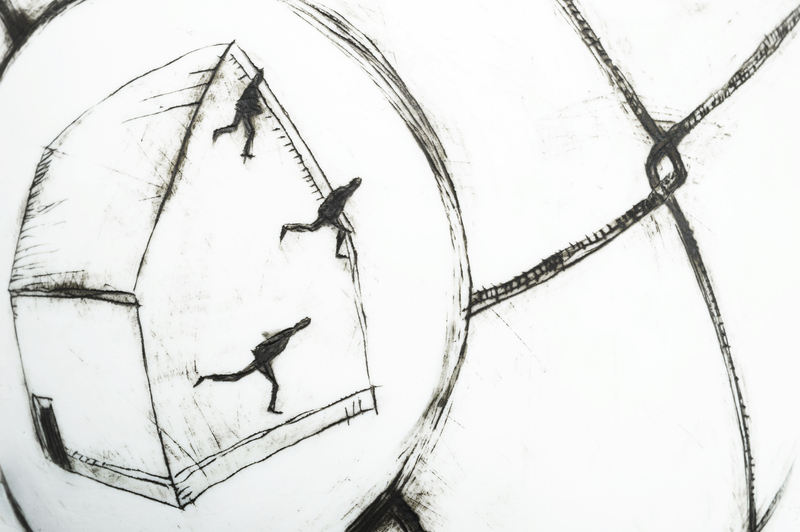 In the work of these artists, an attempt is made to create order out of chaos as the lived experience of unfolding political events is articulated using symbols to tell stories. The visual representation of political ideas and thoughts is achieved by artists Gerry Wedd and Stephen Bowers through their adoption of familiar patterns, such as the willow pattern, to create irony within political narratives. Stephen Dixon references images, such as an historical image of a Roman soldier, to comment metaphorically on political decisions in the twenty-first century. 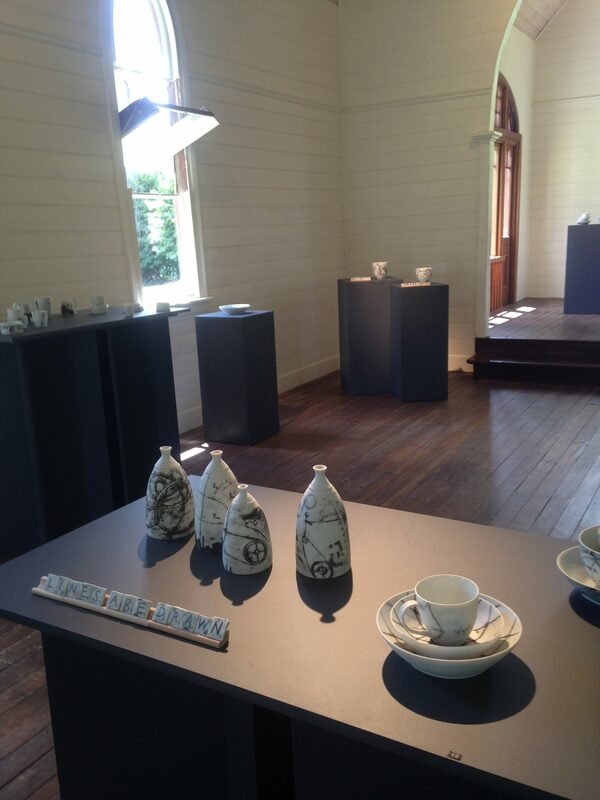 Following this, I discuss the ceramic works created during this research project, communicating political narratives that reflect personal ideas concerning Australian politics, which occurred during 2012 and 2016, the duration of this PhD. My investigation of the surface decoration of Russian revolutionary ceramics and selected contemporary ceramic artists informed my creative research. 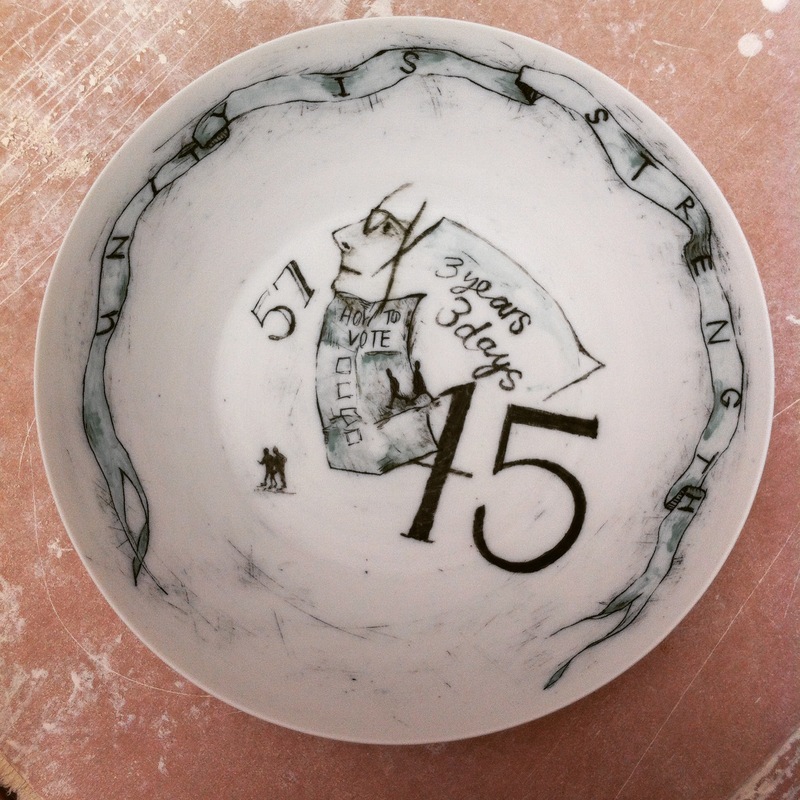 The primary aim of the research project was to create a new series of functional ceramics that express a personal view of selected Australian political events, giving permanency to the issues that impact our lives. My political convictions informed the text and surface imagery which developed on the surfaces. 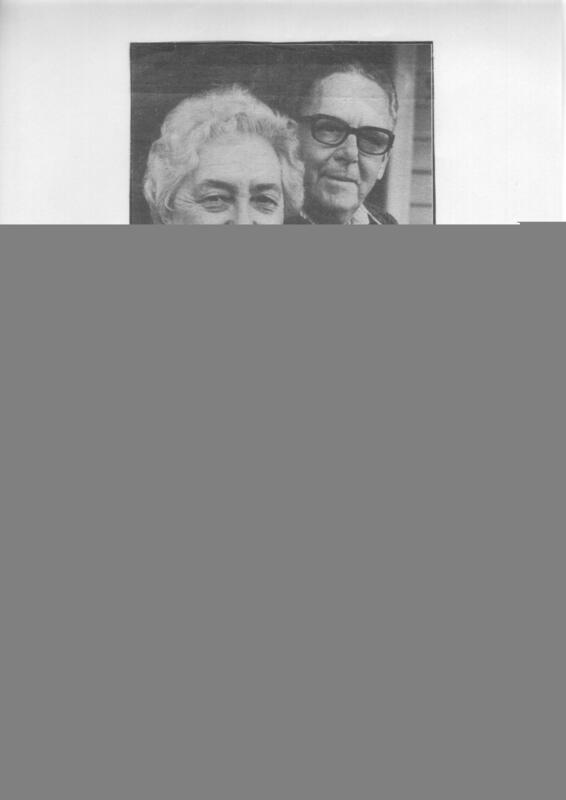 Words and phrases used by the Australian Trade Union movement and sound bites taken from the slogans and speeches of Australian politicians became prominent in my decision to portray a personal viewpoint. A further aim of the project was to develop a visual language that referenced Australian culture and politics. The porcelain works produced as a result of this investigation continue the role of ceramics in documenting, recording, and interpreting political history. 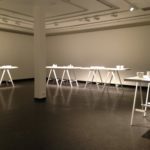 These works explore how text, visual narratives, and ceramic objects can be combined to provide commentary and discourse about contemporary Australian politics. The title of this plate is taken from the Australian Union movement. The phrase ‘Unity is strength’ is often seen on banners and apparel of Union members and supporters during demonstrations throughout Australia. The words are written inside a ribbon as a parody of the Australian Labor Party. From 2007, the ALP, under the leadership of Kevin Rudd, held office however destabilization and dis-unity became apparent. In 2010, following a leadership spill within the party Julia Gillard was elected the first female Prime Minister of Australia. Her time in office was three years and three days, hence the note on the plate. A profile image of Julia Gillard sits above a ‘how to vote’ card alluding to the changes that occurred during the period. Two small figures are depicted with their backs to each other, walking away across the ‘how to vote’ card, representing Julia Gillard and Kevin Rudd. The large numbers surrounding the images – 57 & 45 signify the results of the internal ballot that was undertaken when Kevin Rudd challenged Julia Gillard’s leadership of the ALP and won. Two small figures walking away symbolize the party members that conspired in the disruption and subsequent downfall of the ALP. Following the Russian Revolution of 1915, newly designed plates from the Lomonosov porcelain factory were displayed in shop front windows, heralding the victorious promises of Bolshevism. These plates recorded the history of political change within Russia. 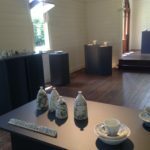 I aim to chronicle the Australian political landscape through my work with porcelain forms and surface design, contributing to the dialogue between politics and porcelain. 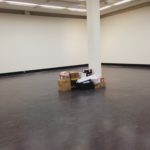 At the end of our week, when all the furniture had been returned to its usual place and our new kitchen floor was looking …well, new, I sat down and thought through the idealistic and innocent views I once had concerning renovation. I vowed to abandon any future wishes of making the house anything other than what it already is-an old house with crooked walls and bouncy floors. It was on the last day, when I was cleaning and putting things back in place that I saw something that made me think. With exhaustion, I slumped into my favourite chair by the back window and I turned to look at the cupboard standing beside me. 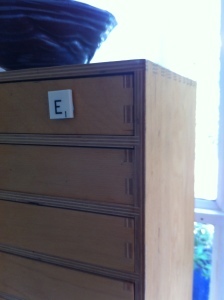 It’s a chest of drawers made from pine ply wood. The joinery is exposed and the grain of the wood is golden and smooth. For weeks, while we have been fixing the kitchen floor I have wondered what sort of kitchen cupboards I would like. We had played around with the idea of ply rather than chipboard and avoiding the flat pack or glossy white surfaces. Sometimes we don’t know where our preferences come from or how our ideas just appear. When I sat down and saw the chest of drawers, I realized where our ideas had been sitting all along. The things we see every day, the colours and surfaces, shapes and images that surround us, actually do have an impact on us. These things stay in our minds; they sit inside our heads and re surface when they please. I honestly had no idea that this was true until the moment I sat on my chair and saw that chest of drawers beside me. I make my work with the belief that what we use every day has an impact on our thoughts and life. It’s the knowledge of this that I didn’t possess and it’s the reason why it surprised me so much. Last week we watched a Ted talk by Amy Cuddy about the idea that you really can fake it until you make it. If you act confident, you will become confident. If you smile, you will feel that smile eventually and be that happy person. If you just sit for 2 minutes every day in a power position, which is leaning back in your chair, feet up on the desk and your arms stretched out and resting behind your head, you will eventually be that person with the power. You can fake it until you make it but more than that you can become it. I see the correlation between this and the shapes around us, the images and colours that live with us influence us, just as the things we tell ourselves influence the outcomes of actions and behaviour in our lives. Things, objects, thoughts, even posture, impact our decisions. How we arrive at an idea or alter our preferences towards one thing rather than another is because of what we hear in our thoughts and see with our eyes. Our view of the world is a reflection of the things we surround ourselves with. There is a book that I am reading and thinking about at the moment that is interesting in a lot of ways. It isn’t a straight art book that I would normally pick up and read, it isn’t even about ceramics at all. It’s actually about phycology, in a way. The title is ‘evocative objects’ and it is edited by Sherry Turkle, who is a Professor at MIT in America that focuses her study on physcoanalysis. The book is really interesting to me as a maker because it talks about the importance of objects in our lives and not only the role they play in our lives but the interchange that happens between the two, almost like saying us and them. The chapter I’m writing for my PhD at the moment (but to be honest, am struggling with) is all about art and its power and the relationship that we have with the art and the objects that we have around us. 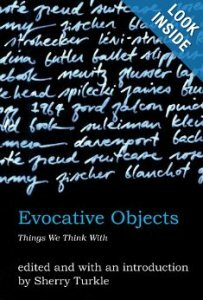 In ‘evocative objects’ however, the emphasis is on what we bring to the objects, not so much what the objects give to us. Thinking about it now, everything is interpreted from our own personal perspective. What you see in an image or narrative will be different to what I see and understand. This is true when I think about the objects around me, which hold meaning for me. When my Nana and Pop died and the family were getting the house ready for selling, we all chose something that was special, something we would want to keep. I chose three things. One has fallen apart – Pops old leather work bag, one sits lonely on the shelf – a porcelain plate with an image of a Scottish dog on the front and one sits under my bedroom window, in need of repair – a 1940’s fan-shaped mirror. These three things possibly didn’t mean as much to everyone else as they did me. Why I chose them was because from my memory and feelings, they spoke to me. Now, when I sit on the end of my bed, which faces the mirror, I see my reflection and I also see Nana and Pops front door behind me. As you walked in to my grandparents’ house, the mirror was situated right in front of you, up high, at the end of the entrance hallway. When I sit down to put my socks on, I see the reflection of their door, I hear the ghost of the patio steps I’ve just walked up and I feel the breeze as Nana had the back door open in the kitchen. I can hear sounds coming from in front of me and her shuffle as she pushed the chair back from the kitchen table where she was seated, to come and greet us. The mirror holds all the faces that walked through that front door, and when I asked if it was one thing I could keep, I had thought that those faces would remain. It is just a mirror though and it only reflects back what is straight in front of it. For me, it holds more than that, for me it is an object that gives me a reason to remember, to keep those memories in my life. This morning, as I sat down to drink my cup of coffee, I had an encounter with my shapes, one that I rarely have, or take the time to notice. As I sat there, I looked, and I saw a cup and a small jug, one beside the other, almost the same height. The jug was a copy of the cup however it was upside down in form, the cup had large letters drawn in soft blue and looked confident and strong. What was so noticeable about these shapes was not just there similarity in size, but the space that was created between them. In between the forms was an almost electric negative space that bounced from one to the other and highlighted the lines, the contours. The contrast in decoration was also striking. The jug held lines and colour while the cup was speaking with large text written around it so all you could see at one time was a large letter. An “e’ was facing me. I like the letter ‘e’, it has a roundness with a sharp edge that is satisfying to draw and to look at. After I had drunk my coffee, disturbed the little scene before me, and then had another coffee – it was an early morning – I thought about what shapes can do, the power that they hold. Over these last few months, I have been in the studio making, making, making. It is sometimes difficult and always challenging. I do lose focus of what the end result will be, quite often, and the process of making takes over. Today, I looked. Today, I saw that more than one shape can tell a story, that the combination of lines and forms can relate to each other and create something new. A photographer once told me, hesitantly, not to fill each piece with so much information, images, lines. I heard him but I didn’t listen. Kevin has also said this to me. Now, I think I understand what they meant – that it takes more than one person to give me advice I will listen to, that it takes more than one cup to make me wake in the morning, that it takes more than one paragraph to make a chapter and more than one chapter to make a book. really terrible photo but I just wanted to update the blog to show that making has become as important as writing was last year. Starting a research project has been one of the most interesting and important thing for me as a person and as an artist, but when you think about it, that’s the same person! studying what it is that interests me in ceramic history and making work based on that research has been amazing. although the work I have here in my quick kitchen photo doesn’t in any way show you the developments I’ve made and the ideas I am exploring, the work is gradually expanding and making more sense to me as I continue to make. I have completed the 1st year of the PhD and still, I am in no mans land! Its quite a difficult place to be but also one that is very exciting. I will stick by the word ‘difficult’ because researching and directing my work,that is the work I produce in the studio directly to the writing and reading that I am doing is a challenge. Running ideas paralell to the study isnt extraordinarily difficult, I think the time inbetween is so small, fitting the ‘process’ time in between reading/writing/making, is the difficult bit. Exciting is the second descriptive word I will also stick by because finally, I am being asked to do this and encouraged to do this and given space to do this in my life. For an artist, sometimes, the juggle to get every thing done is hard work, but through this PhD time, people are ok with me being busy, in my head, in my studio, with my commitments. that is exciting but more exciting than that is the work that I am making and planning and the things I am discovering in my reading/researching. To be honest, that does all sound a bit higgledy piggledy, and often, that is exactly how I feel.